When Asus first announced it was developing the Eee PC, the company said there would be two ways to use the device. First was an innovative new “easy mode” that would replace the typical start menu with six easy to use tabs labeled internet, work, learn, play, settings, and favorites. 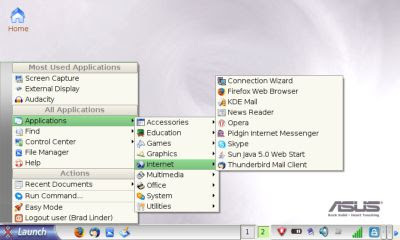 And for more advanced users, there would be a full KDE-based desktop. But now that the Eee PC is shipping, it looks like Asus has disabled the full desktop mode. Sort of. It turns out that you can toggle back and forth between easy and full desktop modes, but you need to install a few packages first. This isn’t very advanced hacking. You don’t need to add any repositories, for example. Read the rest of this article at Eee Site. Actually there is a way to automatically boot to full desktop mode: Settings > Personalization > Login Mode (change to full desktop mode. Cool thanks for the tip…. ill try that. That doesn’t work – there is no ‘Login Mode’ option. I think that you need to install the packages as per this article first. Then you will see the option.